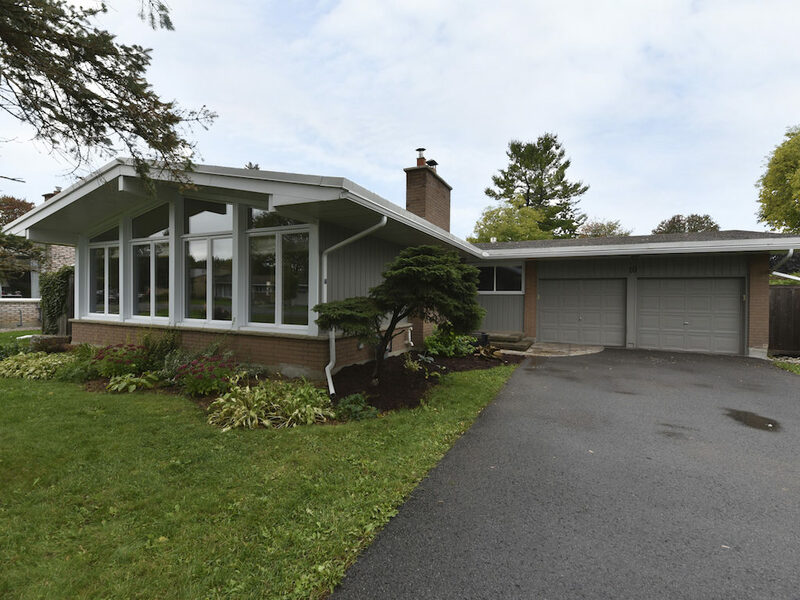 Nestled in the family-friendly community of Arbeatha Park, this beautiful mid-century modern bungalow with 4 main-floor bedrooms and a double-car garage must be seen to be truly appreciated. Opening up into the bright foyer with artistic overhead lighting, the functional and attractive tiling offers easy clean up for those wet-weather days. The open-concept living/dining room is flooded with natural light from impressive A-frame windows (2015). The cozy wood fireplace is complimented by a modern white brick accent wall and rich hardwood flooring. The formal dining area features a whimsical overhead chandelier and overlooks the quiet residential street. The updated kitchen offers newer lighting, beautiful tiled backsplash, deep farmhouse sink, butcher-block counter tops, stainless steel dishwasher and fridge (2013). With ample cabinetry for storage this functional kitchen is an absolute dream. The master bedroom offers hardwood flooring, practical his and her closets, and a renovated 2-piece ensuite (2014). The additional three main-floor bedrooms provide ample storage space and hardwood flooring throughout. Renovated family bathroom (2015). The modern sunroom displays rich wood paneling, contrasting tile flooring and two overhead ceiling fans to regulate the internal temperature. A perfect summer reading nook, or sanctuary for stargazing. Retractable blinds allow the space to be enjoyed in any weather. Sliding patio doors provide access to the large, private backyard which features mature hedges, trees, and garden beds for anyone with a green thumb. The newly renovated, fully finished basement is the center of family activities (2016). The inviting gas fireplace creates a warm and welcoming ambiance for all. With attractive laminate flooring, pot lighting, soundproofed, and fully wired for sound and internet the lower level of the home separates formal entertaining from the whirlwind of day-to-day family life. A spacious guest room, laundry room, and storage area are also found on this level. Only a few steps to nearby walking, hiking, and cross-country ski trails within the NCC Greenbelt for outdoor enthusiasts. Close to amazing schools, shopping amenities, parks, and public transit. Mere minutes to the DND Carling Campus and easy access to highway 416 and 417 … this great opportunity cannot be passed by. Showing a true pride of ownership, come fall in love today! Take Hwy 417 W to Exit 130 (Richmond Road). Turn left onto Richmond Road. Continue straight onto Robertson Road. Turn left onto Stinson Avenue. Turn right onto Ridgefield Crescent. Turn left onto Cherrywood, right on Trinity, then left on Aberfeldy.